Super Hero Boy: Dexter Season One is now on Bluray! Dexter Season One is now on Bluray! Did my Dexter The Second Season review tempt you awhile back? 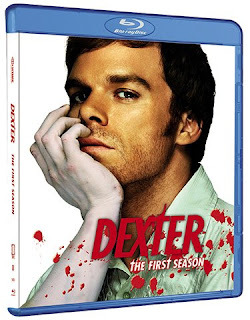 Well for those of you lucky enough to have a Bluray player that would like to invest in the series Dexter from the beginning its your lucky day. Dexter The First Season has been released in bluray and wow... just wow. There is something about bluray that makes everything just a bit more real from facial closeups where you can actually see every single pore on a person's face to the more bloody scenes. It brings a whole new raw look to Dexter that really brings the shoe to a whole new level. Showtime has my attention these days as I seem to be falling in love with their series, I only wish I would have discovered some of them sooner. If your unfamiliar with the Dexter series it follows Dexter Morgan a blood spatter analyst by day to the police department and sort of a vigilante serial killer by night. Though I think Dexter thinks he is doing the world a big favor by killing off people who he feels "deserves" to die it must be a strange existence working both sides of the fence. Dexter had a pretty traumatic childhood and you learn about it slowly as the episodes go on through a series of flashbacks. The bluray set of Dexter The First Season includes three dvds that cover the season as well as a host of extra features including commentary, the first episode of season three which is pretty neat, and some great extra features. Dexter The First Season is available right now on bluray and of course you can pick it up in the standard format as well. I am a huge Dexter fan. I have both seasons, but I can't get Showtime, so I'm just waiting for season 3 to come out on dvd this summer.